Our London based translation agency is one of the leading and fastest growing providers of professional Ukrainian translations. Having the experience working with a variety of clients, from locally based SMEs to some of the largest multinational businesses and organisations, we have developed a translation process, which guarantees not only fast turnaround times and high accuracy, but also an individual approach to each client and their project, without compromising our competitive pricing. Here, at Language Reach, we truly believe that an accurate translation is much more than simply conveying words for words. We understand, that a number of factors can directly or indirectly influence the quality of your Ukrainian translation and therefore we ensure that all possible steps are taken in order to precisely translate your documents. As an agency, we work only with translators and linguists who work exclusively into their native language, in this case, Ukrainian. This ensures that any local dialects or local language variations are also taken into account. Additionally to being a native speaker of your target language, each of our translators, interpreters and linguists are also experts in your given business sector, whether it’s legal, marketing, medical or technical field. By ensuring that the person translating your document has a first-hand experience and an in-depth knowledge of your business sector, we guarantee that any sector specific lingo or jargon will also be translated accurately and reliably. Experience comes with time, and we’ve been working with a variety of clients for a number of years. 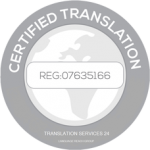 We understand that handling translations can sometimes be quite stressful and time-consuming and therefore we do our very best in order to ensure that from the moment you visit our website right until we deliver your documents back, the translation process is as simple and straightforward as possible. Great customer service is one of our strengths and core values. A dedicated account manager will be assigned to your project in order to provide an accurate quote, break down the costs and answer any questions you might have in regards to your Ukrainian translation if necessary. Need professional Ukrainian translations? You’re in the right place. Get in touch with us today by emailing us directly at info@languagereach.com or giving us a call on 020 8677 3775. Alternatively, you can simply fill out one of the contact forms available on our website and a member of our translation team will be in touch with you in the next 30 minutes!